The Hardy-Weinberg law can also be applied to multiple alle-les and X-linked alleles. The genotypic frequencies expected under Hardy-Weinberg equilibrium will differ according to the situation. 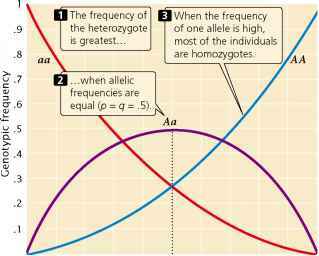 23.3 When a population is in Hardy-Weinberg equilibrium, the proportions of genotypes are determined by frequencies of alleles. X-linked locus with two alleles, XA and Xa, there are five possible genotypes: XAXA, XAXa, XaXa, XAY, and XaY. Females possess two X-linked alleles, and the expected proportions of the female genotypes can be calculated by using the square of the allelic frequencies. If the frequencies of XA and Xa are p and q, respectively, then the equilibrium frequencies of the female genotypes are (p + q)2 = p2 (frequency of XAXA) + 2pq (frequency of XAXa) + q2 (frequency of XaXa). Males have only a single X-linked allele, and so the frequencies of the male genotypes are p (frequency of XAY) and q (frequency of XaY). Notice that these expected frequencies are the proportions of the genotypes among males and females rather than the proportions among the entire population. Thus, p2 is the expected proportion of females with the genotype XAXA; if females make up 50% of the population, then the expected proportion of this genotype in the entire population is .5 X p2. 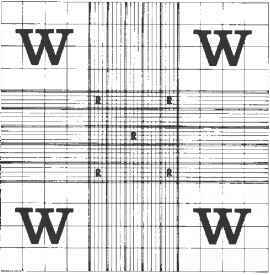 The frequency of an X-linked recessive trait among males is q, whereas the frequency among females is q2. When an X-linked allele is uncommon, the trait will therefore be much more frequent in males than in females. Consider hemophilia A, a clotting disorder caused by an X-linked recessive allele with a frequency (q) of approximately 1 in 10,000, or .0001. At Hardy-Weinberg equilibrium, this frequency will also be the frequency of the disease among males. The frequency of the disease among females, however, will be q2 = (.0001)2 = .00000001, which is only 1 in 10 million. Hemophilia is 1000 times as frequent in males as in females.